How do you party like a millennial? Instagram-worthy moments in alternative venues are one go-to solution, but professional planners need more. It takes careful consideration to effectively design the exceptional experiences this audience craves. What then, makes an event impactful? 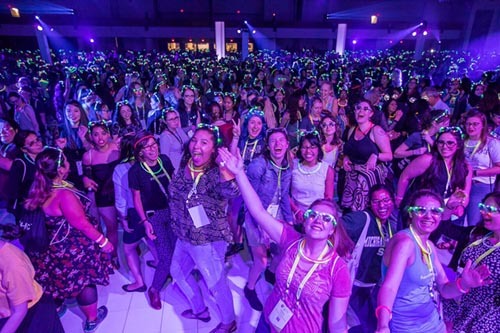 At a recent event in Orlando, Fla., attendees danced, gamed and lit up the night during a high-energy, music-driven evening celebrating a successful conference designed to advocate and encourage young women in technology. Throughout the planning and execution of this event, lessons came to light that can be applied as more millennials move into the workforce. FIRST: Make it easy and appealing. Event organizers noted that they experienced a significant attendance drop when the closing event had previously been held off-site. With the introduction of an off-site space, guests quickly drew their own conclusions about its appeal to them personally, with the result that they made alternative plans. Keeping the event on-site meant that the organizer was able to head off those concerns, and removing any transfer time allowed guests to arrive in a more organic fashion. This ease and speed of access provided opportunity for word to spread earlier in the evening about the atmosphere and activities, boosting attendance. SECOND: Allow guests to create their own experience. At this particular event, personalization and individualized experiences were present at every possible turn. Guests could choose from a wide array of wearable neon accessories as well as the option of customizable body-painting stations. The music followed the same inspiration, with guests given the choice of dancing to an ongoing main-stage DJ battle or being part of a headset disco scene dominated by glittering mirror ball effects. Gaming tables and photo stations expanded the scene for guests more interested in networking than dancing. Highly individualized elements allowed guests to make the event their own and determine for themselves how they wished to engage with the entertainment and other guests. FINALLY: Cater to the audience’s needs. The most successful millennial-targeted events consider how guests will interact in the environment and create catering that can seamlessly become part of that. Happy millennials loving the party. Because the event design encouraged movement and individual activity in a high-energy space, catering stations followed the evening’s glowing theme and offered grab-and-go bites. With guests able to snack as they wished, the overall guest experience continued to flow throughout the room, without jams or bottlenecking. An interesting challenge from this event was that more than 50 percent of the 2,000 attendees were under legal drinking age. In order to ensure legal and responsible consumption throughout the evening, multiple checkpoints were instated at the entry, allowing for vigilance in checking IDs without a lengthy wait for guests. Servers and bartenders also looked for distinctive wristbands provided to identify those of legal age. Providing customizable event experiences offers a more welcoming environment for guests who value self-expression even more than selfies. By considering ways to offer experiences that are easily accessible as well as exciting, planners can help their clients create well-attended events for millennial audiences. As senior creative services manager at Washington-based CSI DMC, Lindsay Routt supports the team’s national and international programs with creative proposal design and innovative solutions for client programs. If she weren’t planning events, she says she would probably travel the world with a backpack. CSI DMC is included on the latest Special Events "25 Top DMCs."